CUSTOMER SERVICE… QUALITY PRODUCTS… PRODUCT KNOWLEDGE… COMPETITIVE PRICES… these are not just bold words; these are words that define IB&S. For over 40 years we have been committed to our customers in helping them take care of their problems and achieve their goals and we will continue to take these commitments seriously in every aspect of our business. If you have ever done business with us, you know these words ring true. If you are a potential customer…just ask around. 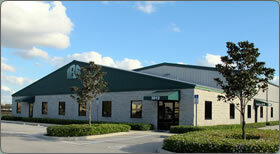 IB&S manufactures their "Grand" line of greenhouses using top quality materials and superb craftsmanship. These engineered structures are wind loaded and have been built throughout Florida and the Southeast. With a Class A General Contractors license, IB&S has the ability and credentials to manage any job whether you require a single house with basic parts or a multiple acre complex including all phases of permitting and construction. An endless assortment of metal parts and components can be sheared, shaped, cut, drilled, punched or welded to your specifications. IB&S has the equipment and design know-how to help you with your fabrication needs.